The Agape Community, located on 32 acres of woodland in Central Massachusetts, is a spiritual community, Catholic in identity and ecumenical and interfaith in outreach, committed to sustainable living and an engaged practice of nonviolence. Our community features a straw-bale house with solar energy, compost privy and “veggie” car run on recycled vegetable oil. We welcome volunteers throughout the summer for long or short periods of time. One positive sign of audience response—a huge audience, maybe the largest we’ve had, some 200 people—was people remaining for most of the day, into the evening with a potluck dinner, lingering around later enjoying banter. A second indicator: people taking notes during the talks, especially during those by Charlie and Arun. Both were brilliant, Charlie’s “looking back: a legacy of love,” in which he limed out the essentials of non violence, love of course, agape love, and Arun’s “non violence in an age of terror.” Arun told stories from the mahatma, always referred to as “my grandfather.” Such as candy and telling the truth. In both cases Gandhi took on himself the task either he’d asked another to do—ask the boy to give up sweets only after he, g, had done so—or punishing himself for a lie told by another—Arun told a lie to grandfather who then decided to walk back the entire 18 mile distance from Durban to the Phoenix Settlement, rather than riding. Arun never lied again. I’d say the major theme of the day, other than non-violence, “Looking forward, looking back: our great non-violent lineage,” was old and young, elders and youth. This manifested in the afternoon panel, “Looking forward: living non violence in these times.” Elders were Arun Gandhi, Eandy Kehler, Suzanne Belote Shanley, and Clair Shaeffer-Duffy, and youth were Bill Buckley, Peter Land, Sheila Stumpf, Edgar Hayes, and Anne Rader. The spirit carried them all to heights of eloquence. It was that same spirit that animates a performer, when the audience is buzzing with expectation, buoys the performer so high he or she can do no serious wrong. Randy told us how he does not make commitments, even during his wedding ceremony to Betsy. They altered the vow to include the words, “we will try to …” and this is his modality—a striving for rather than a promise of. Which many seemed to resonate with, making more human the task of living an off center life in a violence prone universe. Peter delved into how technology disconnects and possibly fosters violence. He observed that one day, walking into a bar or lunch counter, where many knew each other, all were plugged into something, computer, iPod, cell phone, severing connections with those immediately present. He postulated that this disconnect allows us to not experience the human in our midst and thus are more likely to violate them. The interfaith service, tho long, surely included most traditions. Jim Levenson offered Jewish prayers with his Muslim counterpart. Someone from the Buddhist lineage referenced the recent courageous witness of the Burmese monks now leading non-violent resistance to the regime, then she led us in meditation. 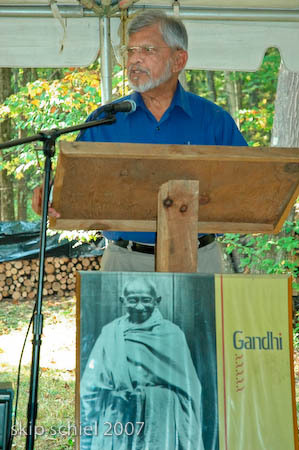 Arun brought up a group of teens to share some of Gandhi’s favorite prayers. We’d begun with a circle dance in the American Indian tradition led by Bruce Davidson and Linda Roemer, and ended with another dance about the Christian trinity. Long, diverse, tiring after a long day. The day was cool, sunny, dry. Evening fell rapidly and many quickly moved inside. Some of us remained outside around the fire. Agape is a pocket of resurgence, sanity, wisdom, commitment (we try). A group of wily folks, young and old, living the dream, honoring our elders, becoming elders, sustained by each other and the higher power, the great force that emboldens us to seek and practice the good. No matter what tradition enlivens us, no matter what path we follow, no matter which system we use to inform and justify our actions, hopefully we aim to a common point: serious love, exuding and spreading love, agape love, love without ceasing, without qualification. In the beginning, love, in the end, love. Love, love, love.